Summary: Ian is a rule-follower. His older sister Jenny is a rule breaker. When they go on vacation, Ian is delighted that there’s a framed list of the rules of the house hanging on the wall of their cabin. To his dismay, Jenny proceeds to break the rules one by one, until she gets to the final rule: never—ever—open the red door. One day when Ian is on her case about breaking rules, she opens the red door. Nothing happens. But that night, all the items she’s abused through her rule-breaking come back to get her. The bathtub with the ring around it that she didn’t clean, the stove that’s empty because she didn’t refill the woodpile, and the rug that’s muddy from her dirty feet, all decide they’re going to cook Jenny and eat her. Ian runs away, thinking smugly that his sister is getting what she deserves. But brotherly love wins, and Ian returns to save the day…and maybe learn a little more about rules. 48 pages; ages 4-8. 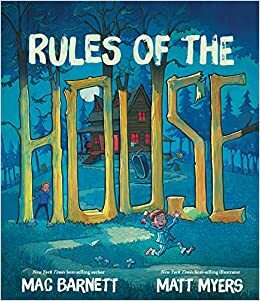 Pros: Award winners Barnett and Myers team up for a fun story that could be used as a springboard to discuss when rules should be followed and when it may be okay to break them. Cons: The set-up was great, with that list of rules ending with the one about the red door, but the ending was kind of lame.